"[We] beat the daylights out of the Japanese, the Nazis. But if big business closes thedoor on the little guy with a new idea, we're not only closing the door on progress, but we'resabotaging everything that we fought for, everything that the country stands for. And oneday, we're going to find ourselves at the bottom of the heap instead of king of the hill, havingno idea how we got there, buying our radios and our cars from our former enemies." If Frank Capra were still making movies in the 1980s, and were a little more cynical, he might have made Tucker: the Man and his Dream. Every aspect of the film is infused with the optimistic, can-do attitude that was so often visible in Capra's classic films, even though the Tucker automobile is doomed to failure at the outset. Indeed, at one point director Francis Ford Coppola tried to interest Capra in being executive producer for an earlier film about Preston Tucker, but Capra refused, since the car was never produced and Tucker's dreams ended in failure. Preston Thomas Tucker is now a nearly forgotten man, although he came close to revolutionizing the automotive industry, and possibly even rescuing the American heavy manufacturing industry altogether. In the heady days after World War II, Tucker had a vision of a streamlined car of the future that included such features as disc brakes, fuel injection, seat belts, etc., which wouldn't be seen in American cars for years, in some cases decades. The destruction of Tucker and the resulting complacency of the Detroit auto industry helped the foreign carmakers gain a foothold that ultimately has reduced the American industry to a shadow of its former self. Although this is, therefore, an important story, it is told in human terms, with verve and interest throughout. Coppola interestingly creates an atmosphere much like the promo film developed by the Tucker Corporation, photographing everything in hyperattractive terms, with romantic 40s lighting and color schemes. We follow Tucker (Jeff Bridges) from the conception of his car, to his struggles to get a plant and financing, through his efforts to raise money from Wall Street, which paradoxically made the factory possible but also contained the seeds of destruction for the company. In order to interest investors, a Detroit auto man was needed as chairman, and the man who took the post subverted Tucker's ideals and innovations at every turn. Ultimately, Tucker finds himself on trial for securities fraud—the result of the Big Three's conspiracies to shut him down—as his dream collapses around him. Bridges does a terrific job of exuding the enthusiasm of Preston Tucker; Joan Allen is similarly good as his supportive wife, Vera. Martin Landau is a standout as investor Abe Karatz who helps get things off the ground; we see here a sign of the talent which would later win him an Oscar in Ed Wood. Dean Stockwell makes a brief but memorable appearance as the already-twitchy Howard Hughes, who secretively lends Tucker a helping hand. He also enunciates the theme of the film in talking about his Spruce Goose: "Who cares if it flies or not? That's not the point." The sadness of a great opportunity lost is counterweighed by the omnipresent feelings of nostalgia and energy. The lighting throughout the film is gorgeous, with most scenes suffused with a nostalgic golden glow. This is a beautiful film indeed. Much of the infectious enthusiasm and optimism of the movie is generated by the wonderful swing score by rocker Joe Jackson. Built in part around the "Hold that Tiger" motif from the Tiger Rag, the music is bubbly and energetic and captures the verve of the period terrifically. This is, to my mind, the best original movie score since Bernard Herrmann died. We highly recommend this film both as entertainment and its faithfulness to a sad moment in history. I would suggest that it be required viewing at the Chicago School of Economics, which holds that there can be no such thing as an antitrust violation or monopoly power; Tucker: the Man and his Dream would be worth more in understanding the abuse of economic power than any three classes in economics. Image Transfer Review: Although the picture is beautiful, with gorgeous color and nice rich blacks, there is some moire and aliasing visible at times. The original aspect ratio was 2.35:1, according to the IMDB, but the picture on the disc is cropped to around 2.0:1 This is the same thing that happened with the DVD of Coppola's Apocalypse Now. In several shots, such as when the Tucker family and the engineers are crowded around the dinner table, the composition is off and clearly improper. This would have been an A transfer if presented in the original aspect ratio. Audio Transfer Review: The DD 5.1 audio remix is highly enveloping and exceptionally directional at times. During crowd scenes, the surrounds are extremely active. This is a very pleasing audio experience, although there is a tiny amount of hiss during quieter scenes. Dialogue and music come through clearly, without any distortion. There is a solid bass footing, though the LFE channel doesn't have a lot to do, but this is a result of the kind of film we have. Extras Review: Francis Ford Coppola gives a new, full-length commentary on the film. 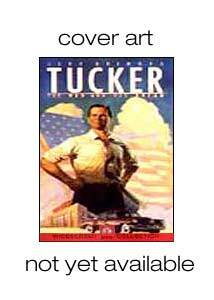 He is clearly enthusiastic about the film and about Tucker himself: as a child the Tucker car made a huge impression upon him. He also sees Detroit's destruction of Tucker as an allegory for the failure of his own Zoetrope Studios, which is rather a stretch but not entirely inappropriate. Coppola points out so many things as being true to life that it would have been less tiring to say that it's all true except the few things he points out as being for dramatic purposes. The track tends to be rather repetitive and overlaps significantly with the commentary for the industrial film. An actual promo film from the Tucker Corporation is included on the disc (14m:51s). Although not in the best condition, it is highly intriguing to see how closely the feature was modeled on this industrial film. Coppola also gives a commentary to this promo piece. Finally, we get the featurette, Under the Hood: Making Tucker. This 10m:01s program is made up of 1988 interview footage with Coppola and producer George Lucas, touching on Coppola's memories of the car and the themes of creativity and innovation which are key to the film. Although short, the featurette contains some highly interesting material which goes more to the meaning of the film than is usually seen in a puff piece. There's no trailer, which seems an odd omission. More to the point, a terrific opportunity for an isolated musical score was missed here. A wonderful film, given a nice transfer (though in a slightly cropped aspect ratio), with a commentary and some interesting supplements. Very highly recommended.